After you have completed the setup process, users can begin entering billable and non-billable time and expenses and tracking when they start and stop work. You will be able to track project costs and client billing, timesheet submission status, time off usage, and available vacation. Entering, saving time record using time entry day view. Submit is only available in week view. Entering, saving, and submitting time record using time entry week view. Timesheets are used to enter time against specific projects and tasks or activities and time off using either day-view or week-view. Users complete and submit their timesheets from week-view to supervisors, project leaders, and/or clients for approval. The timesheets are then reviewed and either approved. When all items are approved, the time information is saved to the database. Once a timesheet is submitted, the data can be analyzed by project leaders and supervisors to determine project status and costs, and to make more efficient resource planning decisions. Billing detail can be generated after submitting of timesheet. 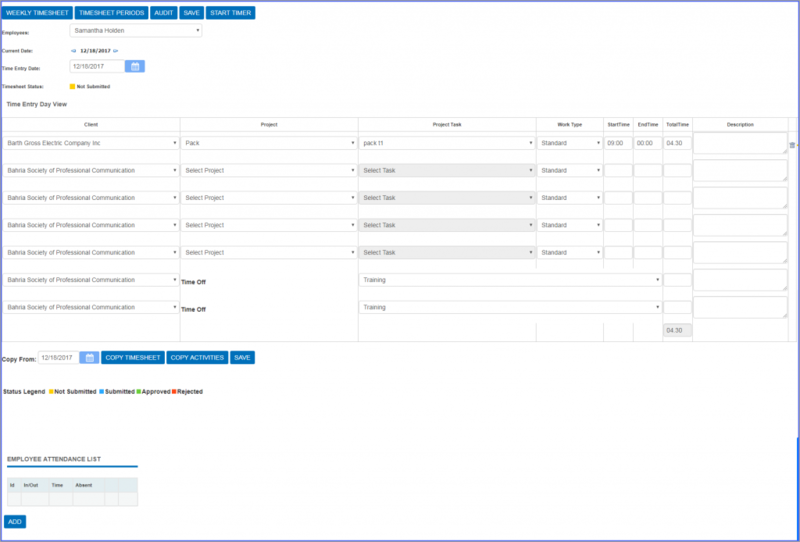 OfficeTimer provides two timesheet formats for entering time entry record in OfficeTimer.